Your path to extraordinary health, control over weight, and younger appearance involves first having to endure a withdrawal/detoxification process that typically lasts 5-7 days when you begin this program. Withdrawal/detoxification occurs when gliadin-derived opiates from wheat and grains are removed from your diet, triggering an opiate withdrawal syndrome. People who previously consumed large daily doses of sugar, e.g., from soft drinks, can experience a lesser form of withdrawal, also, from removal of all added sugars. Put it all together and it can make a tumultuous week or so before you begin to feel better. Unlike just cutting calories, however, successfully completing this process yields benefits that go far beyond just losing a few pounds. No “diet” that involves cutting calories, for instance, can hope to reverse eczema, or irritable bowel syndrome, or fibromyalgia, or cerebellar ataxia like the Undoctored lifestyle can. No diet reduces appetite dramatically as this process can, such that you only eat what is required for sustenance and are no longer tempted to overeat, eat frequently, or lose control. If you adhere to the program and do not experience any perceptible unpleasant feelings, you may be among the lucky. It does not mean that you won’t experience the same kinds of health and weight loss benefits, but that the addictive process for you was not as intense. Nonetheless, it is best to assume that you may experience at least some of the unpleasant effects of withdrawal/detoxification and take steps to soften the process, discussed next. If you are among the people who are going to experience the nausea, headache, fatigue and depression of the withdrawal/detoxification process when grain consumption stops, there is no way to avoid the process. But there are some steps you can take to help get through it. Hydrate more than usual—If you are lightheaded, always consider insufficient hydration. Salt your food lightly to moderately. Do not exercise—except for casual efforts such as walking or leisurely biking. And don’t feel guilty for not exercising! Pamper yourself—Watch a funny movie, call a friend, get a massage. Recognize that the unpleasant feelings of the detox/withdrawal are temporary and will end in several days.Some people, such as those who’ve struggled with migraine headaches, joint pain from rheumatoid arthritis, and some forms of rashes, can experience a transient worsening of symptoms several days into this process: joint pain can flare, headache can be triggered, rashes can itch or become inflamed. Once again, we know of no way to avoid these phenomena, but it is indeed transient, typically followed by reduction in symptoms. If muscle cramps, especially in the calves or fingers occur, hydrate and salt, as above, along with initiation of magnesium supplementation. Consider use of the magnesium water specifically (recipe in the Undoctored book) for faster relief. If you develop excessive gas, abdominal discomfort, diarrhea, or other symptoms from the prebiotic fibers, stop them while continuing the probiotic supplement. Re-attempt prebiotic fibers in 4 weeks; if unpleasant symptoms recur, this suggests that you have small intestinal bacterial overgrowth that may not respond to these basic efforts. See the Undoctored Protocol for Small Intestinal Bacterial Overgrowth for the specific efforts required to deal with this issue, a crucial step in your long-term health and recovery. Once again, if you develop excessive gas, abdominal discomfort, diarrhea, or other symptoms from the prebiotic fibers, stop them while continuing the probiotic supplement. Re-attempt prebiotic fibers in 4 weeks; if unpleasant symptoms recur, this suggests that you have small intestinal bacterial overgrowth that may not respond to these basic efforts. 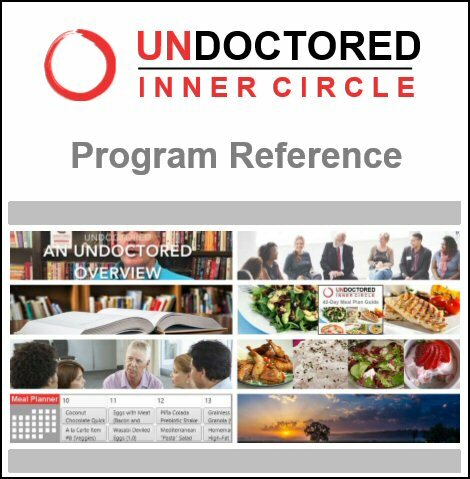 See the Undoctored Protocol for Small Intestinal Bacterial Overgrowth for the specific efforts required to deal with this issue, a crucial step in your long-term health and recovery. Prebiotic fibers are to be continued for a lifetime, while most people are able to stop the probiotic after 6-8 weeks (though longer if you have a gastrointestinal condition such as IBS, ulcerative colitis, Crohn’s disease, or celiac disease). For these first 10 days, the key is to keep it simple. Stick to Undoctored dietary principles but do so through simple meals. It is perfectly fine, for example, to have 3 fried eggs, sausage, and cream in your coffee for breakfast, familiar but safe foods taht require no recipes. Or a steak with steamed broccoli or asparagus for dinner. This way, recipes and meal plans are not necessary and you can simple draw from dishes that you are already familiar with. As you get through this potentially rough period and begin feeling better after the initial detox/withdrawal 10 days, then we will begin to introduce recipes, ways to recreate unhealthy dishes like pizza or cheesecake with healthy replacement ingredients so that you can enjoy these dishes again, along with more elaborate dishes. In case you do prefer to follow a meal plan, even during the initial 10 days of simple dishes, consult the 42-Day Undoctored Menu Plan. If you have diabetes (type 1 or type 2) or hypertension, you will need to discuss the reduction or elimination of some of your medications with your healthcare provider prior to or immediately upon starting the Undoctored program, as blood sugars and blood pressure can drop precipitously even within the first 24 hours of starting the Wild, Naked, Unwashed program. Because hypoglycemia (low blood sugar) and hypotension (low blood pressure) can be dangerous, you need to absolutely avoid their development by discussing reduction/elimination of drugs such as insulin, glyburide, glipizide, and glimepiride, or any blood pressure drug starting before or with initiation of your Undoctored program. You doctor should also help you further reduce or eliminate prescription drugs in coming weeks, adjusted to your individual response. If you have an uncooperative doctor, or one who does not understand your intentions (sadly common—after all, it may be the same doctor who prescribed the drugs in the first place with no appreciation of the fact that most drugs are completely unnecessary), find a functional medicine or integrative health practitioner who can help you succeed safely, someone who empowers, rather than obstucts, your health. See additional discussion about these issues relevant to prescription medications in the Undoctored book. Let's now go over the first ten days of your Undoctored Wild-Naked-Unwashed program, an overview, an idea, of what's ahead in these 10 days or so. This is a very crucial time, because I really want you to get through this process. I will be honest with you: it can be very unpleasant for some people. About half of you will experience a very specific detoxification/withdrawal process. Recall that when we stop grains in the diet specifically, we eliminate the source of a gliadin protein derived opioid peptide, that has opiate effects on our bodies; addictive effects. Effects that make us want to eat more, and give us an addictive relationship with food. We stop it, and we go through an opiate withdrawal syndrome, with nausea, headaches, depression, fatigue, that lasts typically 5 to 7 days, sometimes shorter, sometimes more. Many people experience this process. If you don't experience it, it doesn't mean you've done something wrong. It just may mean that you're not susceptible to that effect, or you experience it much less intensively. If you do, tell yourself it's temporary, right? It's not forever. It's like having the flu. If you have the flu, you don't say: the world is coming to an end — you'll never get better, right? You know there's an end in sight. Same thing here. And on the other side of these 10 days, or so, will be a wonderful change, in how you feel, measures of health, like blood sugar, and blood pressure, and even how you look. I encourage you, somewhere along the way, to get pictures. The start of these 10 days would be a great time to get a “before” picture, and at the end of the 10 days, an “after” (or along-the-way) kind of picture, because there's much more to go in this program. It will help you see just how dramatically things are changing. When you change daily, it's sometimes hard to see the day-to-day change, but when you compare to, say, a 10 day change, you can sometimes see very dramatic effects. Let's start with a conversation about how to soften the severity — soften the blow, I say, of these 10 days. That's all discussed below [the video on the Start Here page] in the text. Start by hydrating. Hydrate more than usual. If you lose, say, 5 pounds or 7 pounds in these first 10 days, about half that can be can water, but that's a good thing, because it's inflammatory water — inflammatory edema that you're losing. It means that inflammation is receding, and that is a wonderful thing. So compensate by hydrating. I've had people actually pass out because they failed to hydrate properly. I would err on the side of over-hydrating a bit — not crazy over-hydrating, just a modest drink-more-than-usual. Watch your urine. It should always be light or clear, never dark, amber or brown. Don't count ounces. That's a silly notion. People often say those kinds of things, but that does not compensate for genetics, for capacity to concentrate sweat and urine, ambient temperature, clothing, season. Your need for fluids can vary dramatically. A fixed amount based on weight is a very misleading way to adjust your hydration status. For now, and before we have these new devices that are going to be coming out soon (to assess your hydration), right now just go by your urine color and drink more than usual. Salt your food. Salt your food lightly to moderately, unless you have doctor's orders for very severe, serious salt restriction, which some people do for kidney disease and other causes (heart failure, etc). If you don't have that, salt your food, because you loose salt along with the water. It helps you not be light-headed. It also prevents having cramps, muscle cramps, in your calves and fingers. Don't exercise, and don't feel guilty about not exercising. Exercising during these 10 days is like trying to exercise during the flu. You don't accomplish anything. You feel awful. It's not worth it. Light exercising is fine; a casual walk, a casual bike ride, etc. Those sort of things are fine. Do it if you feel like it, but don't do it because you have to, because exercise is counter-productive in this process. Also be aware that some people, particularly those with migraine headaches, some forms of skin rash and joint pain, particularly inflammatory joint pain like rheumatoid arthritis, can experience a transient worsening. The rash can itch more, can hurt more, be more uncomfortable. The migraine headache can flare. Joints can hurt more. Just recognize it's transient — typically does not last more than three days. Do what you must to get through it. For instance, if you take migraine medication for the headaches, you might have to do that during this process, because it gets so bad. But know, once again, that it's a temporary process. There's more advice down below [the video on the Start Here page]. Let's now talk about nutritional supplements. Remember, supplements are not just here to be there because we like supplements. They have a very critical role. We are addressing your body's intrinsic needs. If you don't do these things, if you leave them out, your long term success will suffer, and funny things can happen. These are very very necessary for your recovery. Recall that some supplements are there to correct a nutritional deficiency caused by grains, like magnesium. Other supplements are there to treat common deficiencies that must be corrected for you to be successful, like iodine, and also magnesium once again. These are all listed below [the video on the Start Here page]. We divide your supplements into two doses: one in the morning, and one in the evening. It can be with breakfast. It can be before breakfast, after breakfast. It can be with dinner or even after dinner. The timing isn't that important, but it is important that we separate the kelp or iodine from your probiotic preparation. We've done that for you by dividing your supplements into a two-dose regimen. You'll also notice that we don't start with prebiotic fibers. We want to allow the organisms in your probiotics to take root, to seed your intestines first. On day 3 we add the prebiotic fibers, at a low dose of 10 grams per day. And then we increase it, to 20 grams per day, the full, long-term dose, of prebiotic fibers, on day 10 or so. Now, if on either of those days, you get stomach upset, abdominal discomfort, diarrhea, excessive gas and bloating: stop the prebiotic fibers. That tells you have severe dysbiosis, and perhaps small intestinal bacterial overgrowth, where the organisms have abnormally ascended way up, as high as the stomach. Your entire intestinal tract is infected. Stop the prebiotic fiber. Continue the probiotics — let it seed your intestines. Do that for 4 weeks. You can try the prebiotic fibers again. If you tolerate the 10 and then 20 grams, terrific, carry on. If you don't, you can try another round of 4 weeks of probiotics-only, and try again (in 4 weeks) the prebiotics. But if you keep on having those kinds of symptoms, it's time to explore the question of small intestinal bacterial overgrowth, which is discussed further in the Inner Circle videos and the Undoctored protocol for small intestinal bacterial overgrowth. It's very important that you pursue that. How about food, your diet, and your meals. Well, we intentionally keep the first 10 days very simple, because a lot of you won't feel well, right? You'll be tired, and don't want to got to the store, don't want to cook a lot. So we use familiar dishes, so fried eggs for instance, scrambled eggs, sausages and some coffee with some cream in it, is perfectly fine, as a breakfast in these first 10 days. A dinner of a steak, say, or ground beef (without the bun, of course), maybe a side of steamed broccoli or asparagus. Those kinds of very simple dishes, for which you don't need recipes, are perfectly fine, in these first 10 days, to keep your life as simple as possible. After those 10 days, and you're feeling great, you can start getting restless, eager for new, interesting foods, right? That's where we'll introduce some of the new recipes, new ideas; ways to re-create fun foods like a pizza, and cheesecake, and chocolate chip cookies. But now they're going to be healthy. It won't make you fat, won't impair your health, won't cause high blood sugars, etc. So we'll talk about that after these initial 10 days. The first 10 days will be very simple, in the way of recipes and foods, to keep your life, very simple. Now be aware that if you have diabetes (either Type II or Type I) or hypertension, that you must talk to your healthcare provider before starting this program, because this program is so effective, you become much less diabetic, and much less hypertensive, even within the first 24 hours. We do not want any low blood sugars or low blood pressures, because those can be dangerous. People taking insulin, for instance, for their diabetes, or the drugs glimepiride, glyburide, or glipizide, or combination drugs for diabetes, or many blood pressure drugs — if your blood sugar and blood pressure can drop within the first few hours to 24 hours, you need to anticipate that, and your healthcare provide should help you reduce these drugs, or even stop some of them, and likewise, over time, reduce or stop them. If you have an uncooperative healthcare provider, find one who will help you do this, and assist you and make it safer. Because it's so important that you get off these drugs: they're awful. And most people can get off most, if not all, of those drugs. It may take some weeks, or months even, for some people, particularly if they have a lot of weight to lose. But you can do it. It helps to have a cooperative, insightful, helpful, healthcare provider that empowers you, rather than obstructs your success. So off you go. These are the first ten days, Next, we'll take about the remaining time on this 42 day program — the next 32 days, the time in which all these wonderful changes consolidate and go further.